Aston Martin to recall over 5,000 vehicles in U.S.
KUALA LUMPUR: Aston Martin has become the latest global automaker to recall its vehicles from the market. According to U.S. safety agency National Highway Traffic Safety Administration’s (NHTSA) website, around 5,500 Aston Martin vehicles will be recalled due to problems with powertrains and battery cables, all of them in the United States. The British automaker is recalling 3,493 DB9, DBS, Rapide, Virage and Vanquish models produced between 2009 and 2016 due to problems that can cause the transmission park pawl to not engage, which could cause the vehicle to roll, subsequently increasing the risk of a crash. The company is also recalling 1,953 units of DB9 and DBS models manufactured between 2005 and 2009 because their battery supply cables can be damaged when the driver seat is in the full rearward location, increasing the risk of a fire. The auto sector has faced quite a tumultuous 2017, which saw global brands including Honda, Nissan, Toyota and BMW all joining the “recall club” this year. The bulk of these automakers’ problems came from faulty Takata airbags installed in them, which could deploy dangerously and release metal fragments. 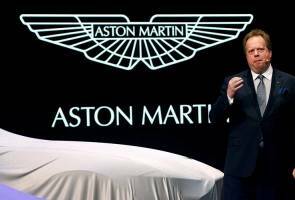 Aston Martin’s recalls are expected to begin on Feb 1 next year. It is not yet known whether any models sold outside the U.S., including in Malaysia, are affected.